Hunt Military Communities is a premier military housing developer dedicated to providing military families with first-class amenities. They manage all new neighborhood construction and property maintenance, so when it came to building a playground, they were looking for a partner who could provide a unique play space and proven, durable products. This playground is located on the Joint Base Charleston Air Base next to the community center, so it needed to be a welcoming space where all the families on base could connect. Playworld designed an aeronautical-themed play space full of custom features. 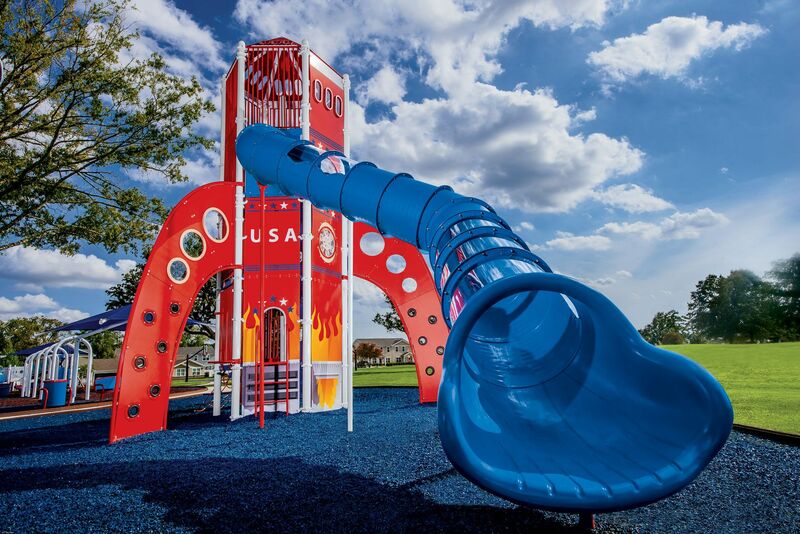 The main rocket-like play structure for kids ages 5-12 features graphic panels with flames and American flare, fins you can climb on, a 15-foot spiral slide, and a 13-foot tube slide. The tall tower sparks imaginative play as kids climb up and blast off on a sliding adventure. The second custom play structure for ages 2-12 is an accessible design with graphic panels that resemble the C-17 Globemaster planes that fly out of the base. Other freestanding pieces like a LiveWire Zip Line and Teeter Tunnel give kids a thrilling ride and encourage cooperative play. When the playground was completed, a ribbon cutting ceremony was held with the base commander and hundreds of residents. They couldn’t have been more excited for this new space and felt that it was a perfect representation of their community.